The Canadian Gold Maple Leaf gold coin has been one of the best-selling gold bullion coins since its launch in 1979. Its popularity soon saw it tagged with a “must buy now" label and nothing has changed today. Produced by the Royal Canadian Mint, the 24-carat gold Maple Leaf is a leader in innovation and has set the standard for gold coin production on no fewer than four occasions. The 50 Dollar Maple Leaf coin is available in various years, but we cannot guarantee any specific year as it depends what we have in stock. Your purchase is therefore a surprise. If you are looking for a specific year, please contact our team prior to your purchase. Why buy the Maple Leaf Gold Coin? There are few coins that can match the 50 Dollar Maple Leaf gold coin for precision engineering, design quality and overall value for money. The ground-breaking bullion is the Royal Canadian's (RCM) flagship product and is manufactured from gold straight from Canadian mines.Recognised as legal tender in Canada, the $50CAD is the highest denomination of the Maple Leaf family although with the current gold spot prices is worth much more than its face value. Since it was first presented by the Royal Canadian Mint, the Maple Leaf gold coin has featured the most recognisable symbol. The intricate design created by artist Walter Ott is an iconic representation of the Canadian flag and appears on the reverse of the coins. On either side of the Maple Leaf symbol you will find the gold content. For the first three years the fineness was .995 but this was improved three later to .999. 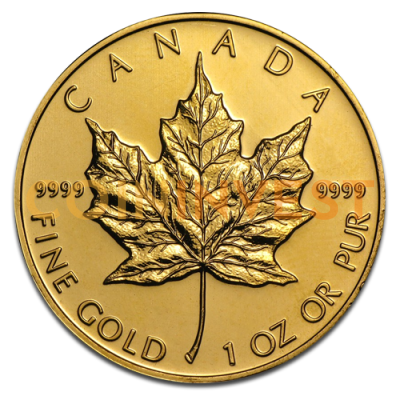 From 1988, gold Maple Leaf coins have a fineness of .9999. Some special issue coins have a .99999 purity, the highest fineness of gold available in a bullion gold. The other features on the reverse side indicate the country of origin as CANADA as confirmation the coin weighs 1oz. of FINE GOLD. On the obverse features the familiar effigy of Queen Elizabeth II in various stages of her life depending on the year of the coin. Coins minted between 1979 and 1988 feature a profile of the queen aged 39-years old, 1990 to 2002 she is aged 64 and the later coins feature the effigy created by Susan Blunt when Her Majesty was 79 years old. Originally produced in 1979, the Maple Leaf was minted to rival the South African Kruggerand and fulfil the global demand for gold bullion coins. Only the second internationally recognised bullion coin available to private investors, the Maple Leaf was an instant success – namely because it boasted a gold content of 99.50% against the Krugerrands 91.67%. The upgrade in gold content saw the Maple Leaf quickly become the most popular gold bullion coin on the market and set new standards for gold production that few refineries could match. In its first year of production, the Maple Leaf more than doubled the price of gold and was selling out rapidly all over the world. 1982 marked another landmark for the RCM and the Maple Leaf by improving their own standards to produce gold bullion coins with a 99.9% gold content. And the RCM did not stop there. In 1988, their innovation enabled them to produce gold bullion coins with a 99.99% purity and is still used as the standard today. In 2007, the RCM broke ground again with the production of gold coins with a .99999 fineness, but these are only issued for special edition coins. Given the RCM's global reputation for innovation, investors of the Canadian Maple Leaf gold coin can be assured the security levels are of the highest quality. It is practically impossible to counterfeit these coins without them being detected by experienced dealers we have at CoinInvest.com. In 2014, the RCM introduced further security measures by incorporating a micro-engraved privy mark of the maple leaf with the number 14 laser-etched on the inside. The number is only detectable with a magnifying glass and marks another success for the Royal Canadian Mint for which they won yet another award for innovation. You can buy various years of the 50 Dollar Canadian Maple Leaf from the CoinInvest online store although we cannot guarantee we will always have them in stock nor can we say what year you will receive – but the surprise enhances the excitement of buying the gold Maple Leaf. CoinInvest are also keen to hear from anyone who has the 50 Dollar Canadian Maple Leaf for sale. As leading dealers of gold bullion we offer competitive rates based on the latest market value. If you do have any coins for sale please do not hesitate to contact a member of our friendly sales team.